March 23, 2018: Interview by Jason White Of Laurie Calhoun on Radio Sputnik International. Topic: What will be the effects of loosening restrictions on US military drone exports? February 23, 2018: Interview by John Harrison of Laurie Calhoun on Brave New World radio program (Radio Sputnik International) about You Can Leave: a novel. Topic: When is a suicide not a suicide? January 29, 2018: Interview by Priya Singh of Laurie Calhoun. Topic: Lethal Drones, Just War, the #MIC and the Media. October 5, 2017: Interview and discussion on Radio Sputnik International, with host John Harrison and guests Laurie Calhoun and Russell Whiting. Topic: Ominous Development of the US Drone Program. February 7, 2017: Interview and discussion, Veritas Radio with host Mike Church. Topic: We Kill Because We Can under President Trump. February 1, 2017: Interview and discussion on Sputnik Radio Edinburgh, with moderator John Harrison and guests Laurie Calhoun and Peter Lee. Topic: Have Drones Put an End to ‘Just Wars‘? January 25, 2017: Interview and discussion on Sputnik Radio Edinburgh, Level Talk, moderated by John Harrison with interlocutors author Laurie Calhoun and Professor David Stupples of City University London, and moderator John Harrison. Topic: Lethal Creep. November 2, 2016 (recorded live) Interview and discussion on FMTalkRadio 106.5 Midday Mobile with Sean Sullivan. Topics ranged from We Kill Because We Can and drone warfare to Brexit/Trump and the question whether Hillary Clinton is a neocon. November 2, 2016 (recorded live) Interview: BBC Radio 4 Thinking Allowed. Topic: Drone Warfare: From Soldiering to Assassination? A 17-minute discussion between BBC Radio 4 host Laurie Taylor, author Laurie Calhoun and interlocutor David Galbreath. September 9, 2016 (recorded September 1, 2016) Interview: Wake Up Call Podcast #113. Topic: The Horrible Implications of Drone Warfare. A 42-minute conversation with Adam Camac and Daniel Laguros about the little recognized and seldom discussed moral, cultural and political ramifications of the use of lethal drones to annihilate human beings deemed worthy of death by their killers. August 4, 2016 (recorded July 1, 2016) Interview: Wake Up Call Podcast #92. Topic: Evaluating Humanitarian Interventions with Laurie Calhoun. A 50-minute conversation with Adam Camac about rhetoric versus reality in so-called humanitarian interventions of military bombing. February 5, 2016. Interview: Desert Austrian / Libertarian Wing Interview: Laurie Calhoun answers Darren Mullen’s questions. December 31, 2015. Interview: SUAS (Small Unmanned Aerial Systems) News: “Extrajudicial Killing Machine”, a conversation with interviewer & commercial drone advocate Patrick Egan, USAF veteran Gene Robinson and author Laurie Calhoun about lethal drones. Podcasted live. December 9, 2015. October 29, 2015. Interview: NetworkRadio, Laguna Beach, California. A wide-ranging conversation about lethal drones and US foreign policy w/ interviewer Fadi Malkos and Laurie Calhoun. Film published online November 12, 2015. October 23, 2015 Interview: Radio One Dunedin, Southland, New Zealand. Abe Gray, Lawrence Hamilton and Laurie Calhoun discuss of issues raised in We Kill Because We Can: From Soldiering to Assassination in the Drone Age. Interview by Abe Gray & Lawrence Hamilton. Recording broadcast on October 29, 2015 (link is to the podcast). October 22, 2015. Television Appearance: Dunedin (NZ) TV, October 22, 2015: “Words Written to Spark Debate”. 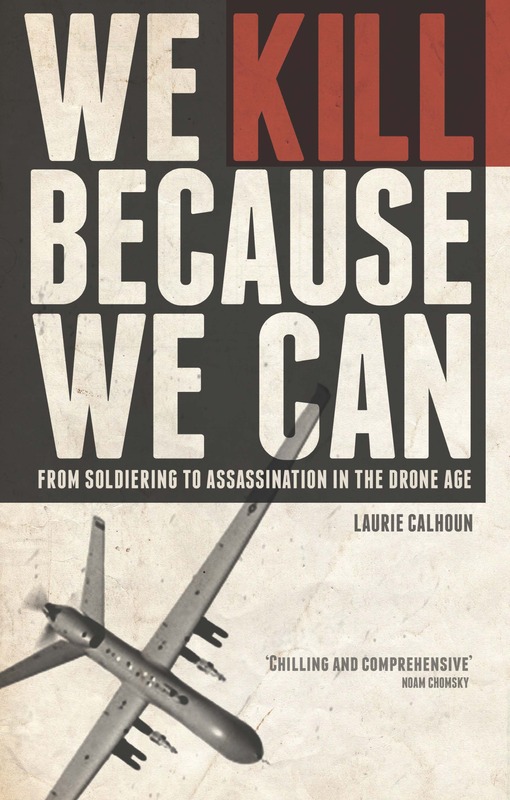 A local television report on the New Zealand launch of We Kill Because We Can: From Soldiering to Assassination in the Drone Age.